Fires are terrifying experiences, especially when it occurs at your place of residence. Just as horrifying as the fire itself is the damage it can cause to your property. After a fire has occurred in your Chicago home, you can expect to deal with both fire and smoke damage. In fact, smoke damage is often one of the biggest issues that homeowners face after a home disaster of this type. When you find yourself in need of residential fire damage restoration services in the Chicago area, you can trust ServiceMaster of Lincoln Park. 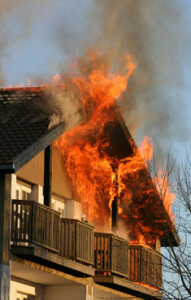 Our prompt, courteous service takes the sting out of experiencing a fire in your home, apartment, or condo. Please contact our office as soon as possible at (773) 346-6767. Our technicians will come to your home, evaluate the damage, and recommend a variety of house fire damage restoration options. Some people take a “do-it-yourself” approach to residential disaster restoration after they experience a fire. What they don’t necessarily realize is that this is a difficult job — a job best handled by professionals like ServiceMaster of Lincoln Park. After a fire, the smoke damage can be more extensive than meets the eye. Build-up isn’t only on the walls and in the carpeting — it usually soaks deep into the crevices and ductwork of your home. If you do not have the proper tools to completely eradicate this type of debris, you risk the health and wellness of everyone in your household. ServiceMaster of Lincoln Park uses proprietary methods to ensure our house fire damage restoration jobs are handled with expertise. We can remove the smoke from hidden places, such as throughout the ventilation ducts and chambers. In addition, we can deep-clean carpeting and flooring to reach far beyond the fibers or upper layer you see, reaching every tiny smoky particle from underneath the carpets. We stand behind our techniques and offer a guarantee of complete satisfaction. You have nothing to lose when you choose ServiceMaster of Lincoln Park for home disaster restoration services in Chicago. Experiencing a fire on your property feels like a personal invasion of privacy. We understand this fact and are compassionate at every step. ServiceMaster of Lincoln Park offers a calm, expert solution to one of your toughest home-related problems. We can also help you work with your insurance carrier to determine what kind of paperwork is necessary, so you receive the maximum benefit in response to your fire. Call (773) 346-6767 for an initial consultation with our ServiceMaster of Lincoln Park team members.